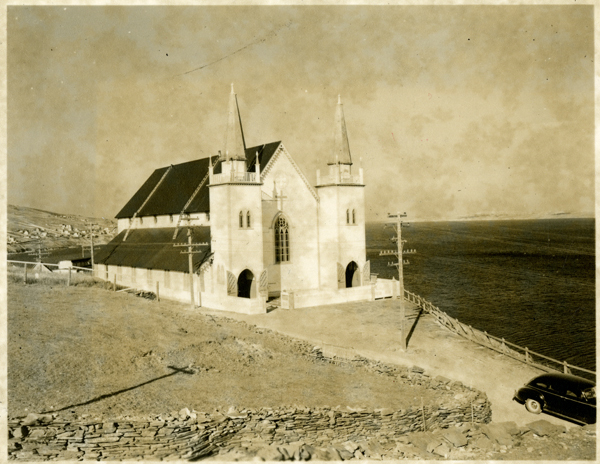 Church of the Holy Redeemer, Church of England, Spaniard's Bay, with car leaving church grounds, circa 1947. Do you have an old photo album that might include images from Spaniard’s Bay? During the town’s Lassy Days celebrations, the Spaniard’s Bay Heritage Society is hosting a scanning party, to help save and share old photos for all to see. The society is looking for old photos of Spaniard’s Bay, from the 1880s to the 1980s, including anything showing old buildings, garden parties, family reunions, or cars decorated for weddings. The event will be hosted in partnership with the intangible cultural heritage office of Heritage NL. Jarvis and Spaniard’s Bay Heritage Society workers will be on site to scan the photographs and ask questions about who or what is in the photo. If you bring your own USB flash drive, you can take home a digital copy as well as your original photographs. The digital copies will be used by the society, shared on Facebook with the owner’s permission, and a copy will be uploaded to Memorial University’s Digital Archives Initiative, which is indexed and archived for history buffs everywhere to see. So go ahead and dig out those old photos, and come out Wednesday, August 8th, at 7pm for tea, treats, and a chat. The scanning party will take place at the Wesley Gosse Heritage Museum, located in the former United Church, 6 Church Hill, across from the Harold Gosse Park and Gazebo.